Also see: "PROJECT ANTHRAX & THE COVER-UP"
a scientific judgment within its "area of expertise," the kind of judgment to which this court gives a "high level of deference." Moreover, as the plaintiffs themselves concede, there is no scientific evidence in the administrative record to contradict that judgment. In the absence of such evidence, we must defer to the FDA's judgment that [the anthrax vaccine] is effective. The appeals court also ruled that the plaintiffs in the suit lacked standing to claim that they have suffered damages due to an allegedly unapproved DOD schedule of inoculations caused by a shortage in the vaccine from 2000 to 2002. In 2005, the same appeals court ruled in favor of the government, which had asked the court to reinstate [JURIST report] the program. The ruling came after a federal district court ruled [JURIST report] that the DOD could administer anthrax vaccinations only on a voluntary basis. 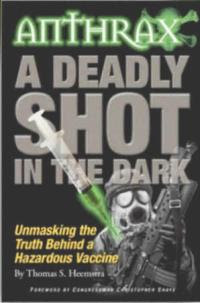 In October 2004, the district court had ordered the DOD to suspend its mandatory vaccination program [JURIST report] because the vaccine had not received proper approval by the FDA. The anthrax was labeled for use by individuals who were at high risk for exposure to the disease, but the Bush administration argued that that definition was broad enough to include military personnel.